We have had some good teams here in Buffalo, but we’re not used to having the best team. Just watched the Sabres (via TiVo) beat the second place team in the Eastern Conference (the New Jersey Devils) 4-3, with the third NJ goal scored with 1 second left. The Sabres looked talented, confident, cool and collected, and … just great. They’re deep, too. At least three lines that are fantastic. All can score, and do! And we have a couple more players coming back from injuries in the next couple weeks! Heading into the playoffs, the Sabes will defintely be one of the – or THE – favorites to win it all. How awesome would that be! 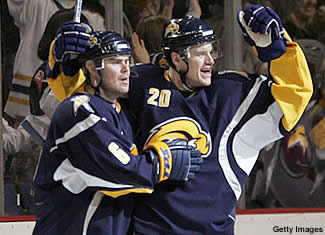 NHL Champs – BUFFALO SABRES. Incredible. Stay tuned… the regular season ends April 8th, and that’s when things get really interesting! I can’t remember Buffalo having a 1st place seed since I have been a fan. I hope that doesn’t make them complacent. I don’t think it will. They know this is their year to win the cup… and I really think they’re going to do it! I found a couple good articles tonight on the Sabres. Click below to read. ← [Link] Time For Takeo To Go?